“Creating a smart network between the farmers and the outer environment is now achievable because of technology… These things are now available for us to use and create a unique solution for farming problems in Africa,” says Chris Cleverly, Chairman of Block Commodities, the UK company empowering African agriculture through blockchain-based technologies and sustainable development. In today’s world, where traditional barriers are constantly being broken down by the latest technological and scientific advancements, we can start to see how these new innovations can be used to challenge long-standing centralised establishments that have until now towered over all sections of society. Understanding the particular economic strengths and resources at a more local level is key to tailoring a growth plan that can addresse the untapped potential and develop a sustainable and efficient ecosystem in each country. In Africa, a continent of more than 30 million square km, land availability is certainly not a problem. The hindrance to economic growth is found in poor management of land resources coupled with inefficient banking practices bound in red tape, leaving most of the farming population on the margins of financial inclusion. The lack of access to services that developed countries would take for granted leaves millions of Africans unsupported when it comes to financial infrastructure. Loans, credit lines and savings accounts are some of the opportunities which remain unavailable to many. The rise of new technological structures is here to shake up the status quo, just in good time. Agriculture is indeed a huge market in Africa: 700 million Africans are farmers. Yet, despite this figure, Africa is a net food importer, with its annual bill being $35billion, estimated to reach as much as $110 billion by 2025. The food deficit in sub-Saharan Africa has grown 570% since 2001, reaching over US$40 billion in 2015. Twenty million Africans face food insecurity, a reality particularly tough in South Sudan, Somalia, Nigeria, Kenya, Ethiopia and Uganda. The region’s largely unsustainable and inefficient agricultural infrastructure, commodity trading systems, and poor resources management have left farmers producing only 50% of the potential that an optimised structure could bring about. Most farmers in Africa can produce just enough to feed their own families, unable to generate any further income. In Sub-Saharan countries, smallholder farmers represent 70 percent of the population. On top of that, banking and financial services are a privilege for many in the developing world: there are 3.5 billion of unbanked people worldwide. The key to developing African agriculture is easier access to fertiliser, which has been until now the real stumbling block. The average global of fertiliser consumption is 135kg per hectare, whereas in Sub-Saharan Africa it is only 17kg, with no increase for decades. With local interest rates for fertiliser purchase going as high as 45% in countries like Zambia, it is nigh on impossible for subsistence farmers to increase their production. Block Commodities, in a joint venture with FinComEco, a fully integrated financial and commodity ecosystem, and supported by Swarm, the leading blockchain private equity fund, is working to tackle the inefficiencies within the African farming supply chain, ultimately maximising production and creating a leading Agritech ecosystem powered by blockchain technology. 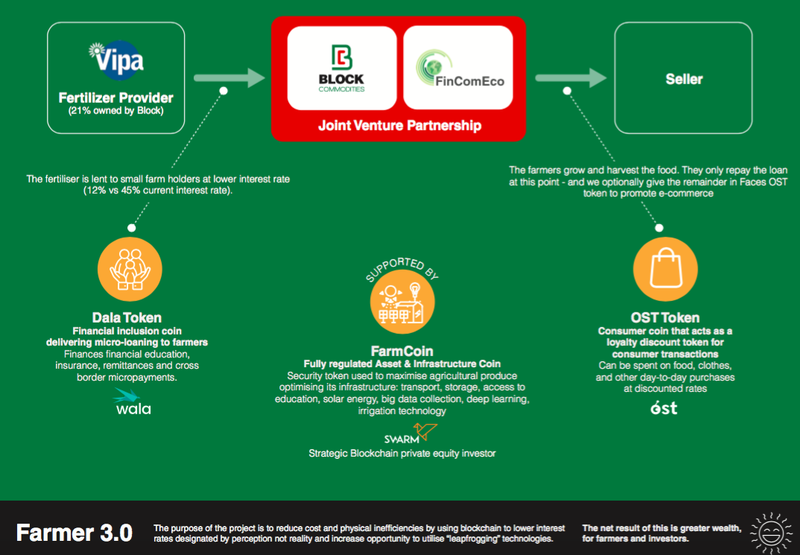 Deploying blockchain technology to create an integrated commodity ecosystem, Block and its partners have developed FarmCoin, a security investment token that provides a fully regulated infrastructure to the commodity ecosystem working together for ultimate financial inclusion for unbanked farmers in Africa. Both having extensive experience in the region, Block and FinComEco have identified the opportunity to deploy blockchain and cryptocurrencies to streamline the agricultural supply chain, with the first step being to tackle the extortionate interest rates for farmers who not could otherwise increase their production. 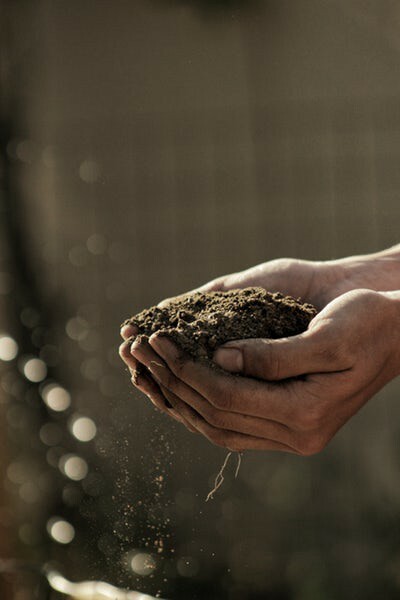 Combining their expertise, they have designed an ecosystem aimed at increasing agricultural output within a permissionless environment, free from the constraints of financial institutions; simply empowering individuals. In the new model Farmer 3.0, farmers are entitled to loans to purchase fertilisers at interest rate of approximately 10%, due to be repaid only after the harvesting period. However, the project is not only about making interest rates more affordable with blockchain. FarmCoin also enables a whole system with conditions which are much more conducive to optimised farming performance. FarmCoin is about investing in infrastructure to spur economic growth in African countries via optimal farming performance. The token will provide more efficient and smoother transactions, movement and logistics, empowering wi-fi connections, data processing, soil analysis, transport and vehicle maintenance, drones and satellite — as well as supporting the development of leapfrogging technologies. Farmers will be able to bring surplus crops to a warehouse to be sold via a FinComEco- facilitated commodities exchange. 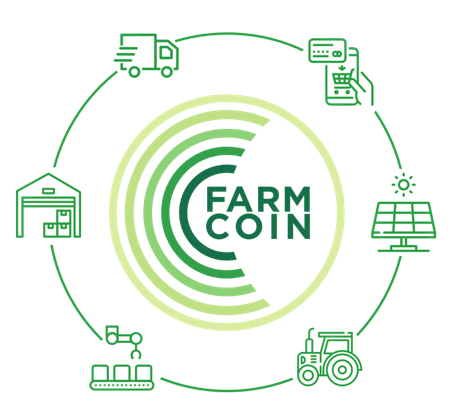 Once the crops are sold, the warehouse fees and loan interest are paid and the net profit credited to the farmer in FarmCoins, which can be exchanged for goods and services, including at educational and medical institutions. Blockchain applications also improve the flow of information, allowing farmers and suppliers to keep production records and analyse the farming market more efficiently. Moreover, with increased consumer awareness about sustainability, carbon footprint and responsible farming, blockchain comes in handy as it allows the food chain to be tracked transparently from harvesting all the way to the end consumer. “The whole development chain can benefit from this token,” says Hirander Misra, from FinComEco, highlighting that increased farming output has the potential to cause a significant increase in African GDP. “It is all about getting farmers access to fertiliser and develop an efficient ecosystem where they can trade easily. Making use of an integrated supply chain and alternative means of finance, African farmers are now equipped to lift from subsistence farming to commercial level, perform commodity trading and access services to support production growth. If we can demonstrate we can improve access and efficiencies, we can make a substantial impact in Africa” commented Chris Cleverly, Chairman of Block Commodities and co-founder of FarmCoin. The pilot project is starting in Uganda end of the summer with 50,000 farmers, and it has full government support. Rapid technology take-up in Africa has also helped with the success of implementation of FarmCoin. In Uganda, over 70% of people now own a mobile phone. In 2014, this figure was 52%. FinComEco counts on the support of key technology partners, like GMEX, Saescada and Codel, who provide applications, banking platforms and software to ensure the smooth running of FarmCoin projects. FarmCoin is designed to provide a strong foundation for farming economies across Africa and beyond, leading the Agritech sector and promoting financial and economical inclusion and growth.